If you've been following or looking for posts, please pardon my delay. I have relocated and started a new position since the last post. It's been quite the transition! I will be up and running again shortly! Meanwhile, please feel free to visit my Wordpress or Instagram page. There is fresh content there. For my instagram, simply scroll down a little. I look forward to posting more process work here. Have a great day! Please pardon my lack of posting in these past few weeks. Work temporarily took over! Let's get back to these step by steps shall we? 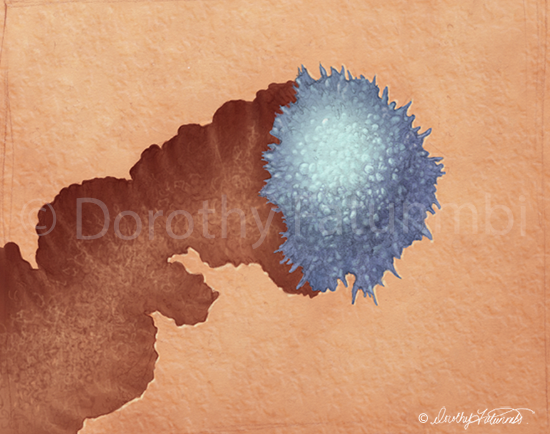 Below, I depict an osteoclast moving across the bone matrix and resorbing bone. Osteoclasts release digestive enzymes that break down the bone underneath. I almost always start with a sketch which I eventually colorize to complement to overall color of the piece. Next, I use big brushes to start indicating form. I used the emboss feature and a textured brush to create the subtle, raised appearance in the surrounding matrix. New: Color and basic shadows. I added a subtle gradient to the background as well. Below I began adding highlighted regions. I also used a textured brush to create the look of chewed up/dissolved bone. If you compare the image below to the one above it, you'll notice that the one below is much warmer. When turning my layers on and off to create these step-by-steps, I must have mistakenly turned off the adjustment layer that colorized the sketch! Below, I have sharpened the highlights and made them just a little more pronounced. I also added detail to make the osteoclast fringes look more embedded in the matrix. 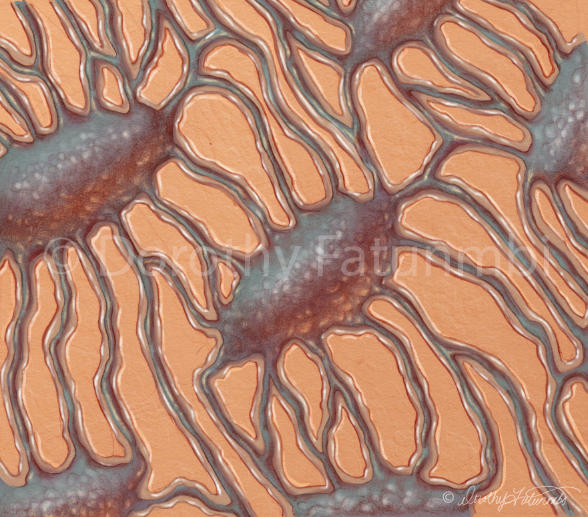 New: Sharpened highlights, detail along the Osteoclast (blue) fringes. Below is the final illustration, with labels, as it appears in the poster. I added the text and arrow in Adobe InDesign. That's it for this week! Thanks for looking! So, here is my starting point for this figure. I will often set my sketch layer to multiply and then colorize it with an additional adjustment layer. I set that layer's transparency to high. In a new layer, I added highlights on either side of the furrow to indicate the viscosity and reflective nature of the fluid. Lastly, to indicate that the cell bodies themselves are also covered in fluid, I extended the highlights on the processes onto the cell bodies. Below is the final illustration with labels. I painted a haze behind the labels to increase the contrast between the text and the figure. That is it for this week's post! Thanks for looking. Feel free to like or share if you found this helpful! If you would like to see more work, visit my Wordpress blog! I discussed some of the process behind this sketch in an earlier post. I had just re-visited the concepts of light, shadow and form and it really influenced my rendering process. The image below goes a little beyond a flat fill and into some rendering. I almost never use black for my shadows. I usually start with a deep color like burgundy or navy. If I want to check if I chose the right shadow color I'll apply a hue/saturation adjustment layer. From there, I will move the slider around the scale while glancing at the illustration. The right hue becomes obvious when I do this. Here, I have begun adding highlights - my favorite part! I chose either a cool or a warm highlight color depending on which side of the osteocyte I was on. My next favorite part - reflective light. I selected colors from the surrounding matrix, and then lightened and increased their saturation. I glazed over the underside of the cell with my brush set to a very low flow in photoshop. Below is the final image with text. That's it! The making of an osteocyte! Come back again to see figure 4! Feel free to visit my Wordpress blog to see more work! This figure is an additional orienting view for the figure that comes after it. 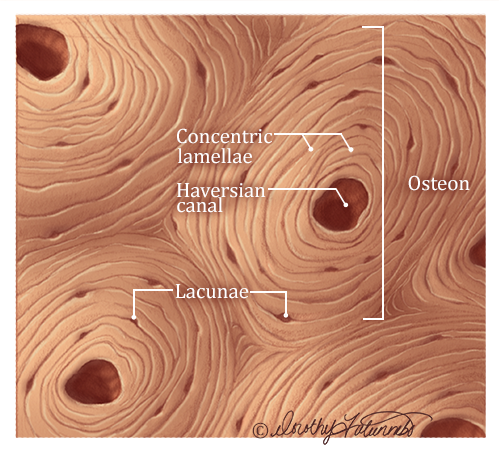 It depicts the general histology of compact bone. I generally start with a sketch which I ultimately colorize in photoshop to remove the gray tones. Next, I add a flat fill. I spend some time here because messy, out of boundary color fills are a pain to find and clean up later in the illustration! For the image below, I duplicated the radiating lines layer, whitened the duplicate using an adjustment layer, and then offset the duplicate from the original in order to get this grooved appearance. This technique is featured on the AMI website here. I've also added shadows. Lastly, I added highlights to the osteocytes, cleaned them up with a stroke and hinted at nuclei. Below is the final image with labels. I hope you enjoyed this post! Up next is figure 3. Some in-progress images showing the development of this figure. It is a cross-section of compact bone. Tools - Adobe Photoshop and graphite. The final figure! 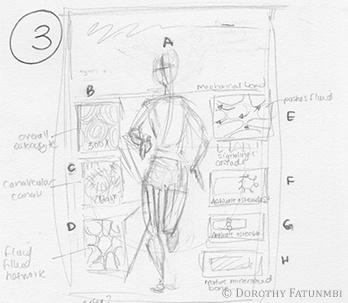 This will be the first in a series that shows the anatomy of compact bone as it relates to bone remodeling. Up next, figure 2! Thanks for looking! Mechanical Loading and the Stimulation of Bone Remodeling. I am really interested in the topic of bone health especially in light of osteoporosis prevention. It is known that bone-building exercises place mechanical loads on the bone. These forces are sensed by bone cells. These cells respond by inducing changes to the bone's micro-architecture and structure. These changes allow the bone to better handle future loads. After establishing those facts, the creative process began! I created a few concept sketches. Two of which are shown below. I went with the concept on the left and then created a few color comps as shown below. Next up is picking a comp and then working through each figure from sketch to final color. Stop by again to see the continued progress of this piece. Thanks for looking! I've heard that good artists are well-versed in the fundamentals. So, I've been revisiting some familiar concepts to refresh myself. First, I revisited the value sphere. After creating the sphere, I immediately applied it to the current illustration that I am working on. It was great to see the direct translation! Left: Sketch pad with value sphere. Right: Illustration of interconnected osteocytes. This is the original post that I made about this exercise. It explains all the little notes in my pad! I have added new content to the site under the Design and Animation sections in the portfolio page. Feel free to check out my WordPress blog in the meantime. Have a good day! Please be patient as I fill this page with content. Meanwhile, feel free to visit my wordpress blog!